A battle has been raging between numerous executive agencies like the Federal Bureau of Investigation (FBI) — and their watchdogs, inspector-general overseers, and the various oversight committees in Congress. The FBI, the Drug Enforcement Agency — and even the Peace Corps — have become increasingly uncooperative with those tasked with keeping them in line. This, combined with the well-documented retaliation against government whistleblowers, makes it clear that the executive branch under President Obama has not lived up to the promise of a new era of transparency made by candidate Obama. Indeed, things have gotten worse. Case in point: the investigation into the “intelligence failures” before the Boston Marathon bombing stands as a reminder of what toothless oversight looks like. 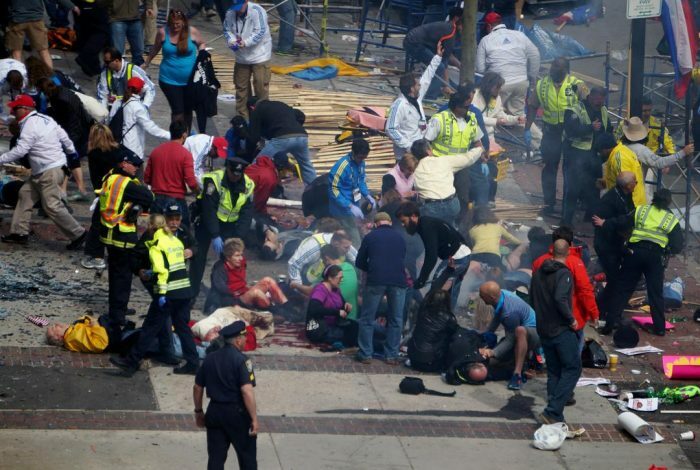 Stymied by the agencies involved, the Marathon bombing investigation found exactly no one accountable for failing to head off the tragic event . Congress, which relies in part on these watchdog reports to fulfill its oversight role, has recently taken steps to stop the obstructive tactics of agencies that become targets of investigation. The problem originated with the FBI, according to Michael Horowitz, Department of Justice Inspector General. Back in 2010, the Bureau started refusing to provide the Office of the Inspector General (OIG) with documents deemed relevant to an internal investigation, such as grand jury records, Title III electronic surveillance (warrantless wiretaps), and Fair Credit Reporting Act (FCRA) information. The FBI justified its stonewalling with a self-serving interpretation of the 1978 Inspector General Act. Congress originally passed the IG Act to bring oversight to a seemingly out-of-control executive branch after the revelations of Watergate, the FBI’s dirty tricks, domestic spying, and CIA assassination programs run amok. But the FBI came up with a creative reading of this statute, one that effectively kneecapped the traditional independence of any IG conducting an investigation. … have access to all records, reports, audits, reviews, documents, papers, recommendations, or other material available to the applicable establishment which relate to programs and operations with respect to which that Inspector General has responsibility under this act…[emphasis added]. But in 2010, FBI lawyers determined that the privacy statutes written into laws like the Fair Credit Reporting Act (FCRA) overruled unfettered access by IGs. Instead, according to Horowitz, IGs were forced to “elevate the matter” to the Agency’s leadership, or to the Attorney General or Deputy Attorney General — significantly slowing the inquiry, and more significantly, upending the independence necessary for IGs to be effective. Other areas affected by nondisclosure provisions and statutes, according to the FBI, are FISA information, attorney-client information, patient medical information, Bank Secrecy Act information, Federal Juvenile Court records, information subject to nondisclosure agreements and memoranda of understanding, as well as “source” information. Once the FBI succeeded in carving out exceptions to an IG’s ability to requisition information, other agencies, from the Environmental Protection Agency to the Peace Corps, followed suit. According to Horowitz — who also chairs the Federal Council of IGs — these actions have seriously impaired the independence of the OIG. But the IG community is fighting back. A number of IGs have banded together in an effort to reestablish their traditionally unfettered access to the records of agencies they oversee. Last year, 47 IGs sent a letter to Congress raising concerns that agency heads were impeding their investigations. Congress also added language to the 2015 Department of Justice Appropriations Act, stipulating that no funds appropriated by Congress could be used by any agency to deny their IG’s timely access to records. A bipartisan coalition of lawmakers introduced an amendment to the original Inspector General Act, which seeks to put an end to the still ongoing executive-agency stonewalling once and for all. The bill will, in part, eliminate the role of federal agencies as supervisors of their IGs. It will also require each IG office to provide Congress with a semiannual report detailing any instances where a federal agency “restricted or significantly delayed access to information, including the justification of the Federal agency or department for such action.” The bill is still working its way through Congress. It was Grassley who asked some of the most pointed questions about the FBI’s intelligence failures leading up to the Boston Marathon bombing — including questions about the FBI’s pre-bombing relationship with Tamerlan Tsarnaev. The DOJ OIG’s access to certain information was significantly delayed at the outset of the review by disagreements with FBI officials over whether certain requests fell outside the scope of the review or could cause harm to the criminal investigation. Only after many months of discussions were these issues resolved, and time that otherwise could have been devoted to completing this review was instead spent on resolving these matters. Redactions in this document are the result of classification and sensitivity designations we received from agencies and departments that provided information to the OIGs for this review. …the OIGs disagreed with the bases asserted. We are requesting that the relevant entities reconsider those designations so that we can unredact those portions and make this information available to the public.